CINCINNATI (AP) — Unexpected stars, unconventional moves, one pleasing win. The David Bell era in Cincinnati got off to an encouraging start for a Reds team trying to finally escape last place. Pinch-hitter Derek Dietrich connected for a three-run homer in the seventh inning Thursday, and Bell went against the book while closing out a 5-3 victory over the Pittsburgh Pirates in his first game as manager. 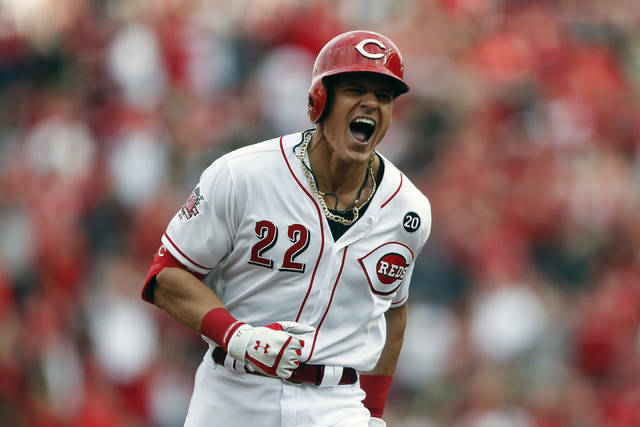 The Reds got starring performances from two players signed for backup roles last month. They also ended the game with a relief pitcher playing center field, a sign of Bell’s openness to new ideas. Two players signed to minor league deals last month became part of Cincinnati’s opening day lore. New shortstop Jose Iglesias doubled twice and drove in a run. After Jose Peraza’s homer off Jameson Taillon (0-1) tied it in the seventh, Dietrich put the Reds up 5-2 with his pinch-hit homer off Richard Rodriguez . Dietrich got a curtain call from the crowd of 44,049, the largest for a regular-season game at Great American Ball Park. Dietrich was known for getting hit by pitches during his six seasons with the Marlins — he set a club record. He never had reason for a curtain call. “I was taking it all in in the dugout with the guys and they were like, ‘Get up there! Get up there!’” Dietrich said. Zach Duke (1-0) retired the two batters he faced. Former closer Raisel Iglesias came on in the eighth and gave up a solo homer by Corey Dickerson. Bell replaced him with two on in the ninth, another unconventional move. David Hernandez loaded the bases with a walk before retiring Dickerson on a grounder, getting his first save since 2017. Dickerson fouled off seven pitches with two strikes to extend the game. Cincinnati reliever Michael Lorenzen got into the game as a pinch runner in the seventh and played the last two innings in center field. He didn’t have a ball hit his way. The win opened a notable season for the Reds. Commissioner Rob Manfred was grand marshal of the pregame parade that kicked off baseball’s 150th anniversary celebration of the first all-professional team, the 1869 Cincinnati Red Stockings. The Reds gave themselves an offseason makeover with three trades, including the addition of Yasiel Puig from the Dodgers. The right fielder got one of the loudest cheers — fans chanting “PUUUUIIIIIIG!”— during pregame introductions and went 0 for 4 with a pair of strikeouts. Pittsburgh’s Jung Ho Kang singled home a pair of runs in the sixth, an early return on the $3 million, one-year deal he signed last November. The Pirates opened the season with a depleted outfield. Right fielder Gregory Polanco is recovering from shoulder surgery, and fill-in Lonnie Chisenhall went on the injury list before the game with a broken right index finger. Adding to the problems, center fielder Starling Marte was a late scratch from the lineup because of a migraine. Taillon allowed three runs or fewer in his last 22 starts of 2018. The Reds got four in the opener, ending his streak. The Reds played a tribute to Frank Robinson on the video board before the game. The Hall of Famer died last month at age 83. In his role as parade grand marshal, Manfred rode in a car with Hall of Fame catcher Johnny Bench. Pirates: In addition to Chisenhall, the Pirates put fifth starter Jordan Lyles (sore right side), C Elias Diaz (virus), RHP Dovydas Neverauskas (oblique) and OF Jose Osuna (neck) on the injury list. They also moved RHP Edgar Santana (Tommy John surgery) to the 60-day injured list. Reds: Put INF Alex Blandino, 2B Scooter Gennett and LHP Alex Wood on the 10-day injury list. Pirates: After an off day Friday, Trevor Williams (14-10) tries to build upon his second-half success last season. His 1.38 ERA after the All-Star break was second-best in the majors behind Tampa Bay’s Blake Snell (1.17). Reds: Sonny Gray (11-9) makes his third career start against the Pirates. The Reds got him in a trade with the Yankees on Jan. 21 after he agreed to add three years to his deal worth $30.5 million through 2022.